The hockey treadmill is the #1 training tool to develop any skater at any level by maximizing their hockey stride, balance and body control. All of these tools will add more speed and strength to your game. Email matt@rogersedge.com or jim@rogersedge.com for more information. More camp opportunities coming. Contact us for more information. The owner of Rogers Edge, Matt Rogers, is a former 6 year professional player and the former skating and skills coach of the Buffalo Sabers organization. He has over 10 years of experience working with players at every level from Mites to the NHL. 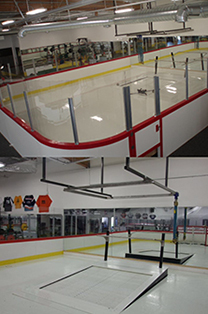 That experience includes ice hockey camps, clinics, treadmill training and coaching. Currently he is the skating coach for Norwich University mens and womens hockey teams as well as the NH Jr Monarchs NCDC team. Matt is also proud to work with a number of Orr Hockey clients from high school through the pro ranks as well as Elite & AAA programs all across the U.S. and Canada.